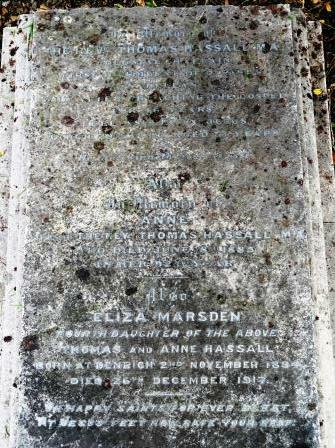 [S759] St John's cemetery database, at http://austcemindex.com/cemetery.php?id=789, Hassall family grave. 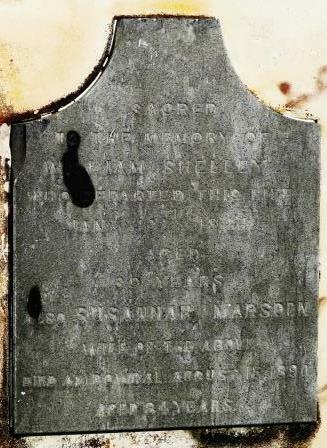 [S759] St John's cemetery database, at http://austcemindex.com/cemetery.php?id=789, Hassall family grave - the inscription here states a death year of 1828, but this appears to be a mis-reading of the original stone. [S516] Book - David J Hassall, The Hassall Family 1798-1998, records he died at birth. [S284] Index - New South Wales BDMs online, at http://www.bdm.nsw.gov.au, Marriage Reg. No. V1819924 147B/1819 and V18192453 3A/1819. [S753] Australian BDM Indexes 1788-1950, at http://www.ancestry.com/, NSW births, Reg. Vol. V18205205 !b and V18201231 148. 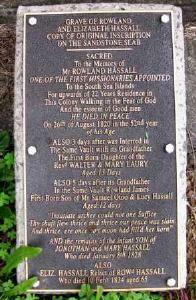 [S516] Book - David J Hassall, The Hassall Family 1798-1998, records he was born 6 days before his grand-father's death. [S516] Book - David J Hassall, The Hassall Family 1798-1998, records he died 6 days after his grand-father's death. [S759] St John's cemetery database, at http://austcemindex.com/cemetery.php?id=789, Hassall family grave - the inscription here states a death day of the 26th, but this appears to be a mis-reading of the original stone. 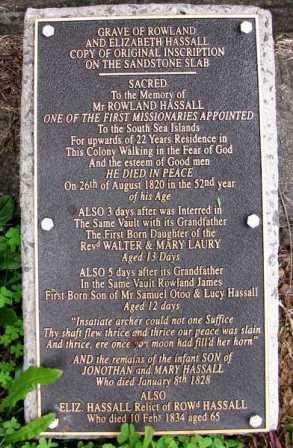 [S1151] Cemetery Marker - HASSALL family members, St Paul's, Cobbity, NSW. [S284] Index - New South Wales BDMs online, at http://www.bdm.nsw.gov.au, 2/1827 V18272 11 and 4001/1827 V18274001 3B. 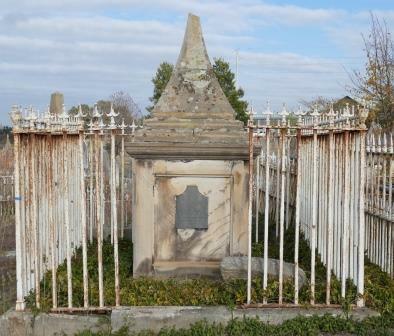 [S1150] Cemetery Marker - , St Saviours Cemetery, Goulburn. [S590] Newspaper - Sydney Morning Herald, issue of 19 Aug 1890, no. 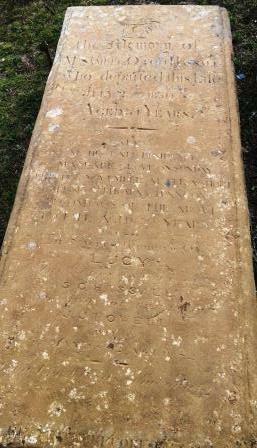 16350, p1, col1, Deaths, age incorrectly given as 81. [S542] Index - New Zealand BDMs online, at http://www.bdmhistoricalrecords.dia.govt.nz/, Marriage Reg. No. 1877/822. [S421] Presbyterian Church Archives of NZ, at http://www.archives.presbyterian.org.nz/, Onehunga marriages 1860-1920, item 2/23/1. [S1041] Book - Jo Ann Hansen Rasch, Blowing Feathers, p147. [S801] Newspaper - Auckland Star, issue of 19 Dec 1917, issue 302, Vol XLVIII, p12, col1, Deaths. [S542] Index - New Zealand BDMs online, at http://www.bdmhistoricalrecords.dia.govt.nz/, Birth Reg. No. 1878/3719. [S801] Newspaper - Auckland Star, issue of 8 Mar 1904, issue 58, Vol XXXV, p8, col1, Deaths, aged 22. [S542] Index - New Zealand BDMs online, at http://www.bdmhistoricalrecords.dia.govt.nz/, Birth Reg. No. 1883/5806. [S542] Index - New Zealand BDMs online, at http://www.bdmhistoricalrecords.dia.govt.nz/, Birth Reg. No. 1884/11033. [S542] Index - New Zealand BDMs online, at http://www.bdmhistoricalrecords.dia.govt.nz/, Birth Reg. No. 1886/1230. [S542] Index - New Zealand BDMs online, at http://www.bdmhistoricalrecords.dia.govt.nz/, Birth Reg. No. 1888/1375. [S542] Index - New Zealand BDMs online, at http://www.bdmhistoricalrecords.dia.govt.nz/, Birth Reg. No. 1890/13293. [S542] Index - New Zealand BDMs online, at http://www.bdmhistoricalrecords.dia.govt.nz/, Birth Reg. No. 1893/9776. [S542] Index - New Zealand BDMs online, at http://www.bdmhistoricalrecords.dia.govt.nz/, Death Reg. No. 2013/10004. [S542] Index - New Zealand BDMs online, at http://www.bdmhistoricalrecords.dia.govt.nz/, Death Reg. No. 2013/10004 gives this birthdate. [S863] Newspaper - New Zealand Herald, issue of 27 Apr 2013, Death Notices.